Marin Software now supports the integration of data from Yahoo Gemini, Yahoo's mobile search and native marketplace, into its platform. Integration of Yahoo Gemini's data into the Marin platform gives advertisers the ability to identify how mobile search and native ads affect the experience of consumers while they are searching and as they make a purchase, allowing marketers to adjust ad campaign targeting, bidding, and creative across search, social and display channels. Hoi-ling Wong, product marketing manager at Marin, said marketers can now see data from native ads alongside paid search and social. "Native ad content gets displayed in the page content," she said. "The ads are not based on keywords, so marketers can hit a broader audience." Yahoo began selling its native Stream Ads earlier this year, followed by the ad media for Tumblr in the U.S. last summer. Marketers trying to target loyal customers should probably stick with paid-search ads because they can finely target a specific audience. Native ads work well when trying to reach a broader audience to introduce new customers to the brand. Native ads garnered a 44-times higher click-through rate and 5-times higher conversion rate than paid-search ads running down the right rail in Q3 of 2013, per Marin. The ads generated a 67% lower cost-per-click (CPC) and a 64% lower cost-per-acquisition (CPA), compared with the ads running down the right rail. 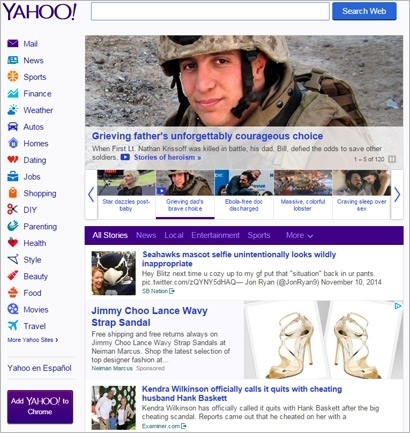 Native ads blend in with general content on a page, Wong said. "The advantage of running both native and paid search lets you blend a general audience with a targeted audience in mobile search," Wong said. "That's the innovation behind Gemini."